In 2017, about one-third of benzoic acid consumption went into the production of sodium benzoate, which is used primarily as a preservative in beverages, packaged food and, increasingly, in cosmetics and personal care products, driving the growth in demand in the past few years. Improving living standards, particularly in Asia, have led to increased spending in personal care products, processed foods, and ready-to-drink beverages. World consumption of benzoic acid in sodium and potassium benzoate is forecast to grow at an average annual rate of 5.5% during 2017–22. World consumption of benzoic acid in benzoate plasticizers continues to grow strongly, and is forecast to increase at an average annual rate of 3.6% between 2017 and 2022; this growth is driven largely by replacement of phthalate plasticizers in an increasing variety of applications. Other major applications include alkyd resins, benzoyl chloride, and animal feed. 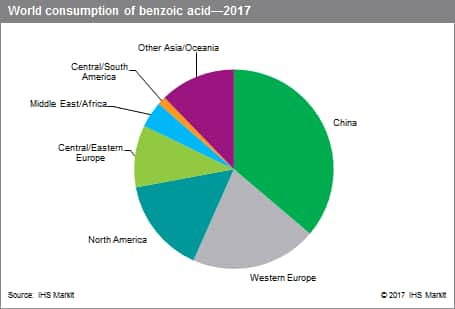 China, Western Europe, and North America combined account for nearly three-fourths of world consumption of benzoic acid in 2017. Sodium and potassium benzoate accounted for most consumption in Asia (where China is the largest world producer and consumer), Europe, and Central and South America. Demand for benzoate plasticizers has also shown sustained growth, especially in Europe and North America, where regulatory issues and environmental legislation have driven the need to replace low-molecular-weight phthalate plasticizers in PVC resins. In particular, benzoate plasticizers have replaced low-molecular-weight phthalates, such as DEP and DBP. World consumption of benzoic acid for benzoate plasticizers is forecast to increase at 3.6% per year from 2017 to 2022. The third major use of benzoic acid is in the production of alkyd resins, where it can be used both as a building block and as a chain stopper during polymerization. This application, however, is gradually losing its importance in Europe and North America because of environmental regulations concerning VOC emissions. Since the early 2000s, alkyd surface coatings have been replaced by acrylic latexes and, to a lesser degree, by epoxies, urethanes, polyesters, and vinyls in many coating applications. Nonetheless, alkyd resin is still the second-most-important application in China, and is also the most important end market for benzoic acid in Russia, the Middle East (particularly in Turkey), and South America (mainly in Brazil). Consumption of benzoyl chloride occurs mainly in China, whereas its use as animal feed is concentrated in Europe.